If you see a link at the top of your Facebook page to ‘simple security tips,’ don’t be surprised or alarmed that it could be a scam. If an offer looks too good to be true, it probably is. Think twice before you click on a link for free airline tickets or other common scams. They even mention in the video that profile viewer scams are not possible on Facebook! Is your Facebook password different than your email password? If not, please reset your password today.For more password related security tips see our article: The Top Ten Commandments of Password Protection. If you forget your password, we’ll be able to text you a new one. To make sure we can reach you, confirm your mobile number.We often encourage our readers to enable login approvals, so that even if your Facebook password is compromised the hacker will need a code sent via text message to access your account. There is also a link to Advanced Tips. 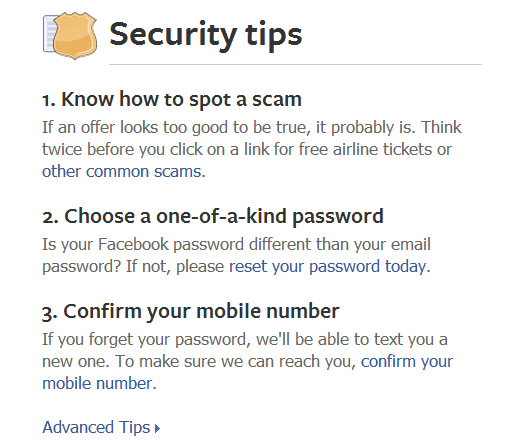 We are very glad to see Facebook taking steps to educate their users on security issues affecting the platform. Hopefully this will result a safer environment for everyone. Also remember to visit our own Safety Center where we have almost 30 articles on various privacy and safety topics.